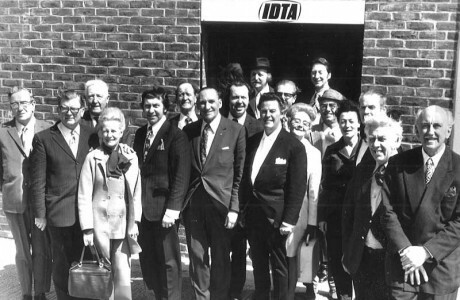 From a small group of founding members in Manchester, to a global Association with over 7000 members, the IDTA has been at the very heart of dance since 1903. In 1903, a group of teachers in Manchester area formed an association, the Manchester and Salford Association of Teachers of Dancing. The prime mover was James Finnigan – the arranger of the dance the Military Two Step – and it is interesting to note that James’ great-granddaughter, Julie Laird, is currently a prominent member of the IDTA. With time the ‘and Salford’ was dropped from the name of the Association and then in 1938 the name was changed to the Empire Society. In the first decade of the century, other small associations were established and four such were the English Association of Dancing Masters, Premier Association of Teachers of Dancing, Universal Association of Teachers of Dancing, and Yorkshire Association of Dancing Masters. In 1930, these four bodies amalgamated to form the International Dancing Masters’ Association. This body grew in strength and stature until in 1955 it was felt necessary to become a company limited by guarantee. Meanwhile, Birmingham area teachers joined together in 1920 to create the Midland Dance Teachers’ Association. This body grew beyond its original area base and changed its name in 1958 to the Dance Teachers’ Association. Shortly after in 1961 it merged with the Empire Society retaining the name Dance Teachers’ Association. In 1967, the IDMA and DTA merged, becoming the International Dance Teachers’ Association, retaining the Limited by Guarantee status of the IDMA. This merger created one of the largest dance teacher organisations in the world. Indisputably, it had the largest membership of ballroom dance teachers. In 2004, Buckinghamshire New University, in partnership with the IDTA, launched a Foundation degree in Dance, giving the opportunity for dance teachers to continue their professional development and gain an academic qualification while working in their chosen specialist field. The first cohort graduated in September 2006. The University developed two full-time dance degrees and consulted the IDTA and members of the dance profession and industry on the course content. Main image: Manchester Association of Teachers of Dancing, Annual Conference 1926. 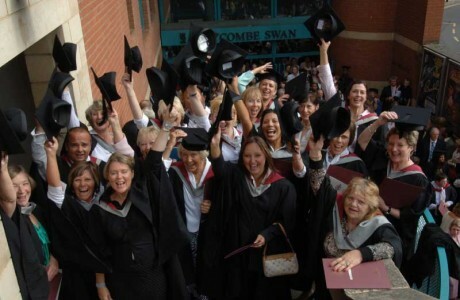 Bottom image: Graduation of the first cohort of students from Buckinghamshire New University in 2006, having been awarded the Foundation Degree in Dance.